The ANZAC Day dawn service at Gallipoli has become a very popular event and each year the crowds at Gallipoli get bigger and bigger. In the past, it was the older generation who were interested in participating in this special remembrance ceremony, but these days more and more younger people are interested to be part of it as well. Younger travellers from Australia especially are timing their Europe trip to coincide with attendance at the Gallipoli dawn service. Day 1 – Arrive Istanbul and spend three nights in this city. Day 4 – Gallipoli & Dawn Service – Leave Istanbul early this morning for Gelibolu. Sightseeing tour of Gallipoli peninsula and the war memorials, including Lone Pine, Chunuk Bair and 57th cemetery, etc. before heading for Anzac Cove. Here, you will be camping in a secure outdoor area where you’ll spend the night outdoors – a sleeping bag will be provided. Day 5 – Anzac Day Dawn – Take part in the traditional Anzac Day Dawn Service. You can also do the 2.5 kilometre walk to Lone Pine for the Australian service. Afternoon leave for ferry crossing and journey to Assos. Day 6 – Visit Troy before returning to Istanbul and enjoy the rest of the evening at leisure. Day 7 – Fly from Istanbul to Budapest to embark your river boat moored in Budapest city centre. 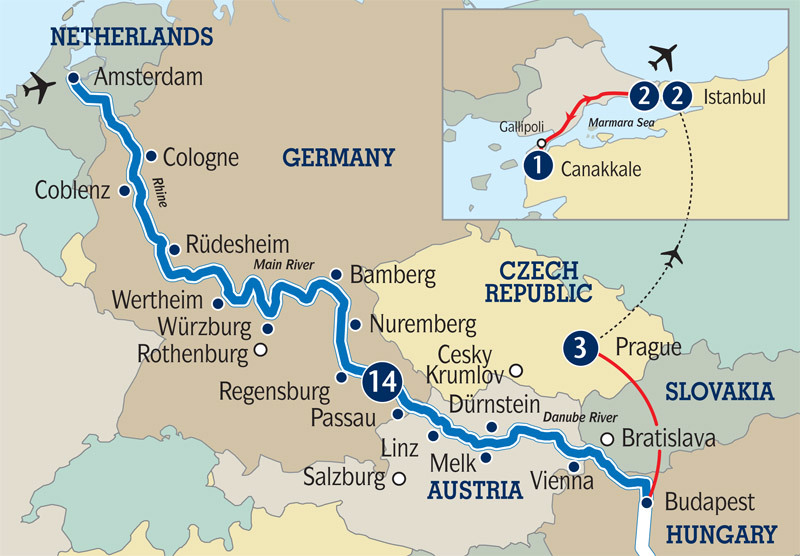 Day 8 – 21 Cruise from Budapest to Amsterdam. This is the reverse of the Amsterdam to Budapest itinerary- see our comprehensive day-to-day cruise report here. Day 20 – Istanbul – Gallipoli: On this tour you will leave your Instanbul hotel at 23:00 on the eve of the Gallipoli ceremony. You will travel by coach to arrive at North Beach and the ANZAC Commemorative Site at 4:30 a.m., in time for the 5:30 a.m. service. There’s no camping outdoors on this tour. Day 23 – Istanbul. Transfer to airport after breakfast.